This meeting was hosted by Jolene. Present were Beth, Betty, Carla, Jolene, Linda, Michèle and Shirley. Jolene made a lovely ham and cheese pastry roll. 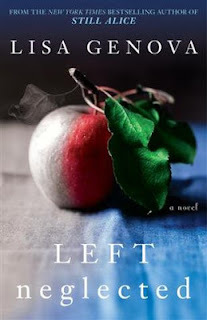 The book discussed this month's was Shirley's choice Left Neglected by Lisa Genova. Ms. Genova who is a neuroscientist, has written two other novels, all related to the functions of the brain, Still Alice whose main character has Alzheimers and Love Anthony about an autistic child. Left Neglected is the story of Sarah and her family and how they cope with a neuropsychological condition she is left with after a car accident. Left neglected is a condition in which deficit in attention to and awareness of one side of space is observed. Sarah and her husband are type A personalities and organize their life in a "type A atmosphere" with three children, two homes and plenty of activities scheduled around their high-powered work lives. When Sarah has a car accident, her husband tries to continue the same lifestyle with the help of Sarah's mother. Sarah in a rehabilitation centre and with physiotherapists tries to get back all her physical and psychological abilities so she can jump back into their type "A" lives. Generally the book was enjoyed by all members. We all felt that Ms. Genova's medical background made the description of the condition and its impact very realistic and the rehabilitation Sarah had to go through credible. However we also found the writing style a bit choppy and the stream of consciousness with Sarah was sometimes too much. This can be because of Ms. Genova's scientific background and better editing could have corrected it. There were several relationships that were well developed, Sarah and her mother, Sarah and her son Charlie, her relationship with her therapists. Hoewever, some of us would have liked to see better development of Sarah's relationship with her husband Bob. All found that Ms Genova's desciption of their family life before Sarah's accident was well done and gave us a good picture of life on a treadmill. Ms. Genova also did a very good job of describing Sarah's difficulities coping with the limitations her condition caused, the step by step therapy she experienced and the humbling experiences she went through because of her condition. A good example of this is their night out to their favourite restaurant to celebrate their anniversary. The story has a happy ending and though some of us thought the end of the story was too quickly wrapped up, most were particularly pleased to have read a book with a happy ending! Linda reminded us that a lesson learned from this story is that we must all appreciate what is important in life and not neglect our family, friends, and the life around us. She has given us a challenge for our next meeting to report back about at least one thing we have done that we keep putting off that would give us or someone else some satisfaction. Another book was suggested for those who would like to read on similar topics, My Stroke of Insight by Jill Bolte Taylor. Thank you Shirley for an interesting read!